I’m as giddy as a kid in a candy store. With the launch of the new MarTech Conference, I’ve been given the joy of creating a program that covers the kinds of topics that I’ve always longed to see addressed in the world of marketing technology — presented by hand-picked speakers of impeccable credentials, brilliant ideas, and infectious passion for this amazing intersection of disciplines. Today, we’re announcing the agenda for the inaugural MarTech Conference that will be held this August 19-20 in Boston. It includes 14 talks and “fireside chat” sessions from many of the pioneers, thought leaders, and experienced practitioners in marketing technology. 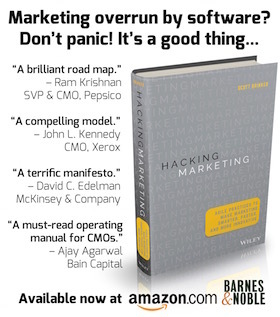 One of the things you’ll notice immediately is that this is a program largely about marketing technology management. The topics skew heavily towards people and process, beyond just the underlying technology. To be sure, the technology swirling in marketing these days is incredible. But as is frequently noted, technology is at best a source of potential. To unlock that energy and harness it, you need the right people and processes. Yet while that golden triangle is frequently acknowledged, I’ve found that few conference programs address the issues of people and processes in technology-powered marketing. Our intent with this inaugural MarTech program is to rectify that — to bring into the spotlight the organizational and management innovations that transform technology potential into marketing performance. To Build or Buy Your Own Marketing Cloud? But wait, there’s more! We have a few more agenda additions that will be announced shortly, including a very special speaker to kick off the conference with a truly big idea — an exponentially big idea (that’s the only hint I’ll give for now). We’ll also be announcing several CMO and CIO guests who will be the interview subjects for the fireside chats hosted by Jane and Michael. And there are a couple of limited opportunities for sponsors to offer educational sessions that will show off the state-of-the-art of their solutions. But the best part of MarTech still promises to be you. This event will be a phenomenal gathering of marketing technology executives and experts, who will be able to share experiences and ideas with each other in a venue that is dedicated to this fascinating intersection. You only have until June 6 to purchase early bird tickets. So if you like what you see in the agenda, I encourage you to register now. Come join us at the end of August and be prepared and inspired to enter the busy fall season with groundbreaking ideas and insights that will propel you and your organizations forward in the dynamic world of marketing technology. Finally, let me close with a huge thank you to the MarTech Advisory Board — Eduardo Conrado, Sean Ellis, Mayur Gupta, Jane Hiscock, Terence Kawaja, David Raab, and Virginia Sharma — who were invaluable in helping to shape this agenda.